Seeing an Indianapolis Indians baseball game...or not. 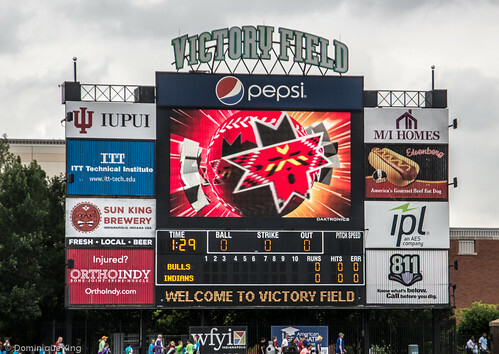 Tim and I love watching baseball or hockey games when we travel, so we really looked forward to seeing the Indianapolis Indians play during our most recent visit to Indianapolis. 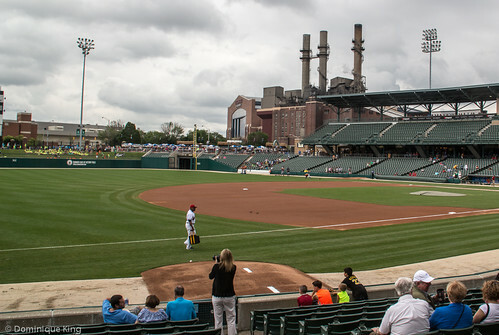 Play at the Triple A-level promised to be a fast-paced contest as the Indianapolis Indians lead the league this year and play at this level usually features great pitching that more closely matches the quality of the Triple A-level batting talent. Pitches at this level can easily clock in at 90-plus miles per hours. We've seen Triple A-teams several times over the years as we're close enough to be able to get down to see the Toledo (Ohio) Mud Hens, who play in the same league as the Indians, play the occasional matinee game as a day trip. Victory Field, the Indians' home ball park, features more than 13,000 seats, a small berm area with lawn seating and nearly 30 luxury seats. 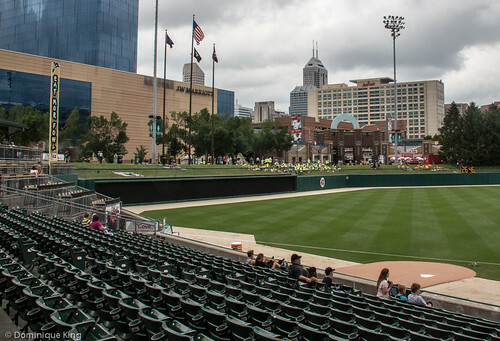 Victory Field became the team's new home in 1996 and sits near downtown Indianapolis in the White River State Park. 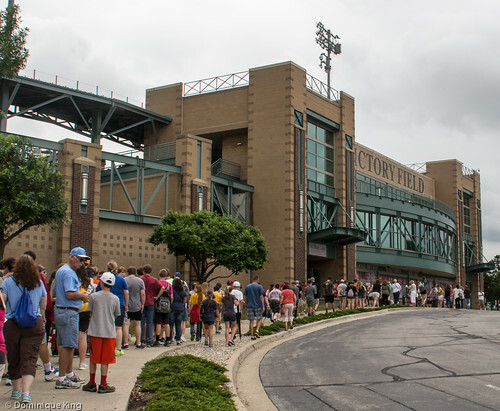 The team tops many lists as one of Minor League Baseball's best ball parks and the team holds several minor league attendance records in recent years. 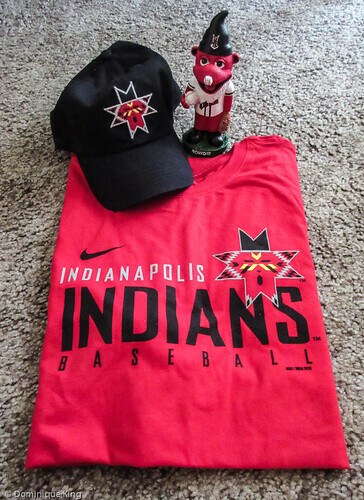 The Indians have a long history, dating back to 1902, as one of the oldest minor-league franchises in American professional baseball. The Indians currently serve an International Minor League affiliate team for the Pittsburgh Pirates and claim baseball greats like Major League Baseball Hall's Harmon Killebrew and famed right fielder Roger Maris as Indians' alumni. The Indians, like many Minor League teams, are heavily involved with their local communities. The team just announced their involvement with a national group called Reviving Baseball in Inner Cities (RBI) programs during our visit. The RBI program, dubbed locally as Playball Indiana, seeks to revive interest in the sport among urban youth who may have difficulty finding a team to play with by helping to fund teams, improvements in urban ball fields and help provide equipment and uniforms for teams. The Indians pledged $100,000 over the next five years to helps fund the group's efforts in across central Indiana. 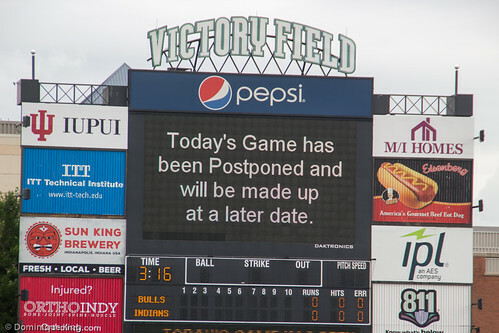 So it was with high hopes as we waited for the first pitch of the game scheduled for 1:35 p.m. that afternoon. I started exploring the ball park and managed to get a few images before the skies literally opened up and quickly dumped rain on the field and the waiting crowd! We fortunately managed to grab seats in Victory Field's Cove, a small semi-covered area beyond the left field foul pole where we were one of the fortunate few to enjoy a beer in semi-covered shelter while we waited to the rain to dissipate. Thank goodness we had some handy, dandy disposable rain ponchos (courtesy of the team) and the handy, dandy two-gallon plastic zipper lock bags that we always pack in our camera bags to protect our electronics! There was a short break in the downpour and it looked like we might be able to see the game after all as the team mascot, Rowdie Bear, briefly came out onto the field and workers checked the tarp-covered field. We thought the team might be able to play after the short rain delay. Alas, the rain started up again, and officials called the game for rain. 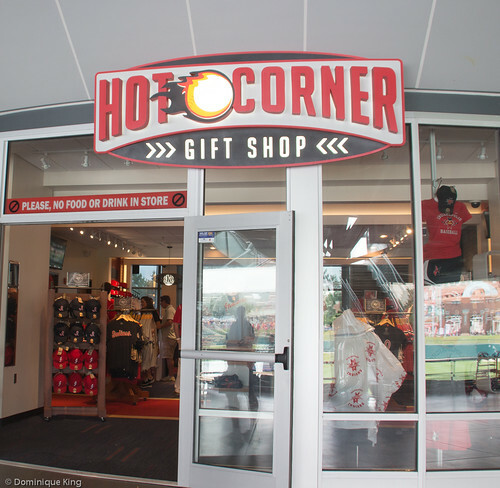 We really missed seeing the game, and I doubt we'll be able to get back this year to use our tickets as rain checks, but we did manage to hit the souvenir store on the way out to get some team apparel for both of us. It's still possible to catch up with the team online on the Web, Facebook, Twitter, Instagram or by signing up for the team's newsletter or reading the team's official Inside Pitch blog, which includes game recaps, official box scores and play-by-play account of each game. Rowdie Bear, the team's mascot since 1993, even has his own Twitter account and Facebook page! Here's hoping we'll see Rowdie and the Indians again soon.